Major lines such as Celebrity Cruises and Princess Cruises will ditch Ireland entirely if plans to curtail ship calls go ahead, Feargal Barton, owner of Bartons Transport, told Travel Extra. 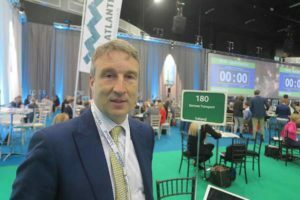 He said that although he understands Dublin Port’s position that cargo operations are its bread and butter, there’s a bigger picture at play. “Cruise is only 2-3pc of their business, so it’s not going to be high on their priority list and if there is a shortage of space you can see why cruise liners are being pushed to one side,” Mr Barton said. But he said “whether the economic case can be made on the port side … for Ireland Inc side it’s a massive, massive blow”. He said the cruise sector is worth around “€50m-€60m a year and is growing, with the turnaround of ships in the last few years”. He said the decision of the likes of Celebrity to homeport in Dublin – something the port has “gone and fought hard to get” – was a “big coup for Ireland and Dublin Port to get”. Dublin Port has itself said that from 2024-25, once major construction works on a 400-metre quay wall have been completed, cruise calls will increase to 150. Mr Barton is a member of the All-Ireland Cruise Ship Action Group, a group of businesses across the tourism, retail and transport sectors who have come together to campaign against what it calls “the Dublin Port Company’s surprise ban on cruise ships entering Dublin Port from 2021”. He said that mixed messages are coming from Minister Shane Ross’s office and the port. Mr Barton said Shane Ross assured tourism partners that the port is not “not stepping away from cruise business”, with a temporary reduction in cruise calls. She said that Dublin Port has disbanded Cruise Dublin, pulled out of Cruise Europe, Cruise Ireland and Irish Tourism Industry Confederation and are not attending any cruise industry trade shows.